Stories have been told for thousands upon thousands of years. Originality is difficult to achieve. Every twist of every classic tale has been tried. So I guess it was just a matter of time before someone wrote a film about an aging rock star with a fleeting-yet-arguable resemblance to Ozzy Osbourne on a road trip through America as he hunts for his father’s Nazi persecutor from Auschwitz. Paolo Sorrentino’s This Must Be the Place definitely has a weird premise. One so weird, that it might just work. But it doesn’t. It teeters on the line between black humour, drama and character study, never really delving into any of them enough to make it a cohesive film. It seems it is trying to both reflect reality and be whimsical, so much so that neither note is really hit. 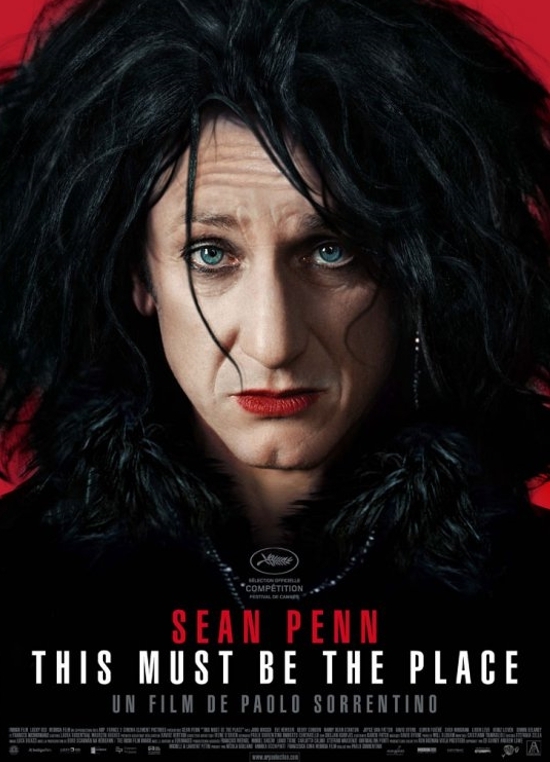 Sean Penn plays Cheyenne, a former rock-star who by his own description played melancholy music for melancholy kids to make as much money as possible. When his music had a Helter Skelter effect, he gave it up, and thirty years later spends his days pottering around his Irish mansion, playing handball with his fire-fighter wife (Frances McDormand) and dragging a wheelie-bag around shopping centres; all whilst made up in his lipstick and big hair. On paper, this actually sounds really good to me. But the film itself seems like it is desperately striving after eccentricity, which makes it feel forced. I liked the idea of seeing what might happen to a glam rocker who has given up his music. I like the idea of an unusual plot. I even like the idea of a film about a Nazi-hunt themed road trip. What I didn’t like was Sean Penn. It’s a bit unfair really – I think he did an excellent job of building and portraying a realistic, strange character. The problem is that Cheyenne is just so damned irritating. He speaks slowly and monotonously for the whole film. He leaves thoughts half finished, repeats other people, and most of what he says is deeply, deeply unnecessary. It’s like listening to an Ent giving a lecture on watching paint dry. In slow motion. The first half hour of the film is spent painstakingly setting up characters and storylines which ultimately end up only half explained, unresolved, and which don’t really affect the plot. The rest of the film feels like a number of short stories, loosely strung together by the idea of a vengeance-fuelled road trip. Individually the components work; there’s a story about a young mother and her son who is afraid of water. In another part, Cheyenne visits the floral-and-cat-cushioned home of the former wife of his father’s tormenter, a retired history teacher who would regularly skip over the holocaust. There is even a cameo appearance from Talking Heads’ David Byrnes performing the title track. Weaved between all this, are the pseudo-profound observations of Cheyenne. He muses on life, on despair, maturity and addiction. All of these are only alluded to however, and in the end come off with only a shallow kind of depth. It’s a welcome relief when the plot stops to allow for a five minute conversation about the history of wheelie bags. It’s not terrible. It just doesn’t work as a whole. Maybe it would have worked better as a series of ten minute stories. If the movie was designed to “make you think” and “ask deep questions”, then it failed. Unless the questions we were supposed to leave the cinema asking ourselves were along the lines of “why does Lady Gaga…what?”, “who is Mary” and “what is in that bag he carries everywhere, and why can’t he just leave it in the hotel”. Ironically, in the end the only really ‘meta’ and vaguely profound thing in this film is the prophetic way Cheyenne himself repeatedly says “something is not quite right here”. Spot on. This entry was posted in Film, Reviews and tagged Frances McDormand, Nazi, Paolo Sorrentino, Sean Penn, This Must Be the Place. Bookmark the permalink.